1 - 2 $64.80 ea. 3 - 4 $61.20 ea. 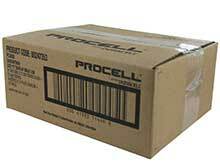 Duracell Procell C batteries are high quality power sources that are designed to withstand the rigors of hard work. This value-minded 72 pack is comprised of (6) 12-packs that are easy to organize and distribute, and have an incredibly long 7 Year Shelf Life. Procell C batteries are designed with an impressive capacity that makes them one of the longest lasting alkaline batteries available. Duracell Procell batteries are made to hold up in even the harshest working conditions, and their reliable lasting power makes them ideal for any workplace or job site. Please refer to the Packaging Guide to better understand how these batteries are packaged and sold. When placing an order, 1 unit is equal to a case of 72 batteries. Within the case, are 6 boxes of 12 batteries. We also sell the box of 12, on its own, if preferred. Regardless of package size ordered, all of the C-cell batteries have the same wrapper and chemistry. These Duracell Procell C batteries are also sold individually, if preferred. Good price & quick shipping. Fast delivery on these, price was good and batteries have great life span and performance as one would expect from ProCell. As Low As: $111.60 Ea. As Low As: $18.60 Ea.